Dai Jin (戴進, 1388–1462), courtesy name Wenjin (文進) and pseudonym Jing-an (靜庵), was a native of Qiantang (modern Hangzhou). He is said as a youth to have studied painting under local artists, specializing and achieving fame in the fields of landscapes and figures. During the Xuande reign (1426–1435), Dai Jin was recommended for service at court, where he was admired by the nobility for his great skill. His fellow painters, however, became envious and later dismissed him. 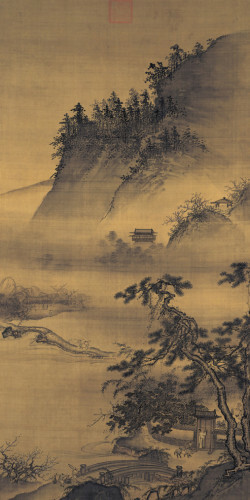 Dai Jin thereupon returned home to the south, where he continued to paint in Hangzhou. With numerous students, he came to have an enormous influence on painting at the time. 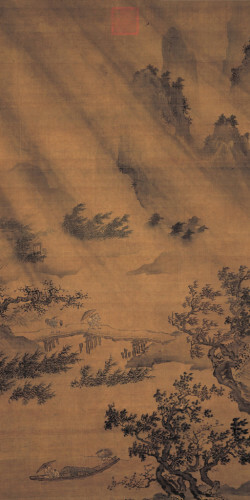 Dai Jin was one of the leaders in the early Ming revival of the Ma-Xia (after Ma Yuan 馬遠 and Xia Gui 夏珪), or academic, style of landscape painting of the Southern Song (1127–1279), which came to be called the Zhe School because Dai Jin was from Hangzhou in Zhejiang. Dai Jin did not merely repeat the patterns of the Southern Song academy but rather, like other artists of other schools and traditions of the time, he saw the past as providing motifs for further elaboration. 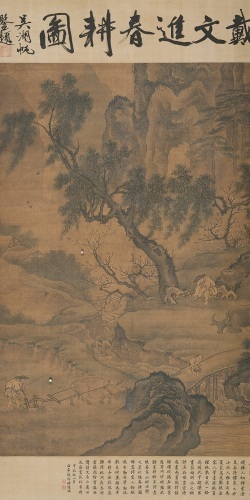 The Zhe School was later placed within the lineage of “professional” painters and held in lesser regard in contrast to the school of literary “amateurs,” who were more concerned with personal expression and who were then represented in the Wu School in which Shen Zhou (沈周, 1427–1509) held an equivalent place of leadership.